Lotan ke Chhole Kulche - Navigating your way to Lotan is not an easy task. Thankfully, we were graced by the presence of Sanju Aneja who took charge and after some turns from the Barshabullah Chowk - left, right and zigzag, we made our way to the most famous Chhole Kulchewala, who took little notice of the crowd around him and was busy preparing his chhole kulche. Sitting with an arsenal of masalas around him, Lotan's Chhole comes in three different varieties - mild, medium and hot, ordered according to the degree of spiciness. Though the medium one is spicy enough, the hot one is a must try for all those who can tolerate heavy dosage of red chilli. Topped with coriander, white raddish and grated ginger, the dish is exquisitely prepared and one dollop of butter makes it even better, highly recommended for the not so calorie conscious. 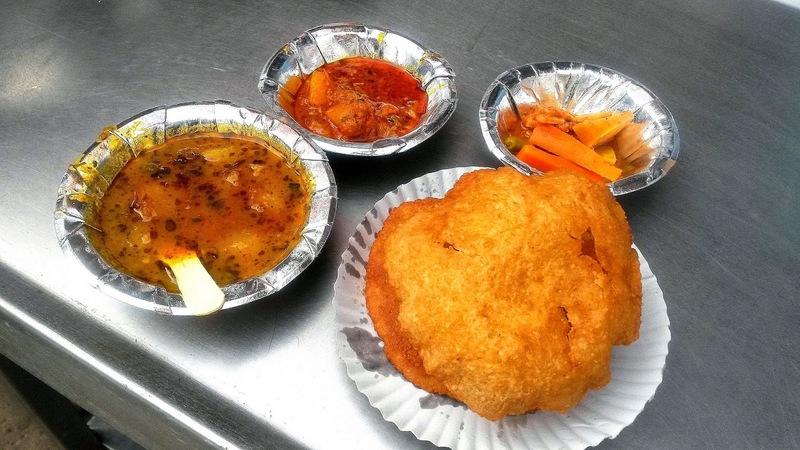 Bharath ke Kachori - Located at a short walk from Lotan, at the Barsabulla Chowk is Bharath's shop. 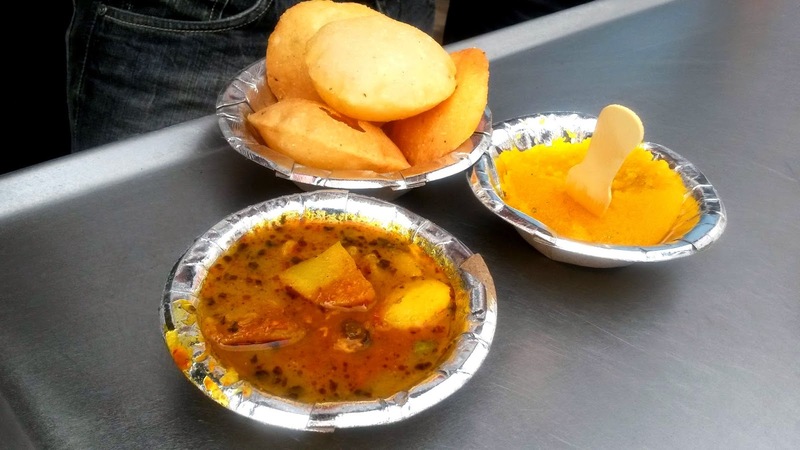 Bharath's shop makes hot kachoris and serves them directly from the kadhai. 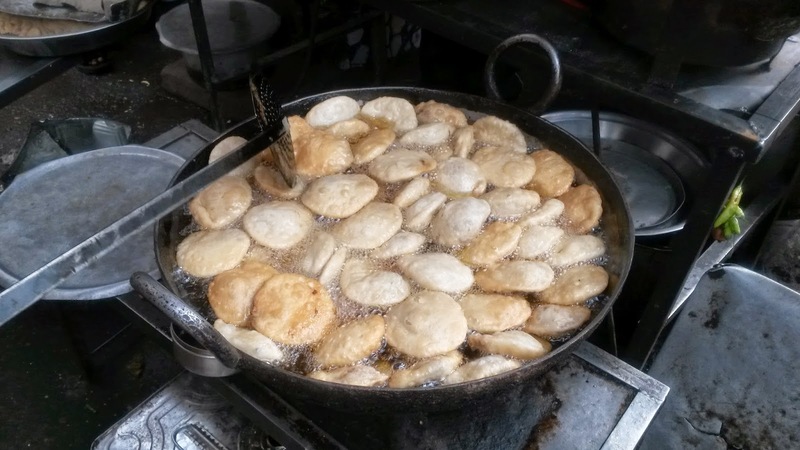 These kachoris are piping hot and are filled with a mixture of ground urad dal, black pepper, chilli powder and salt to taste. Shyam Sweets was packed when we reached there. Even on Sunday mornings, the place was flocked with people, hungry for their everyday fare - delicious Rasamalais, Bedmi Puri and Nagodi Halwa. 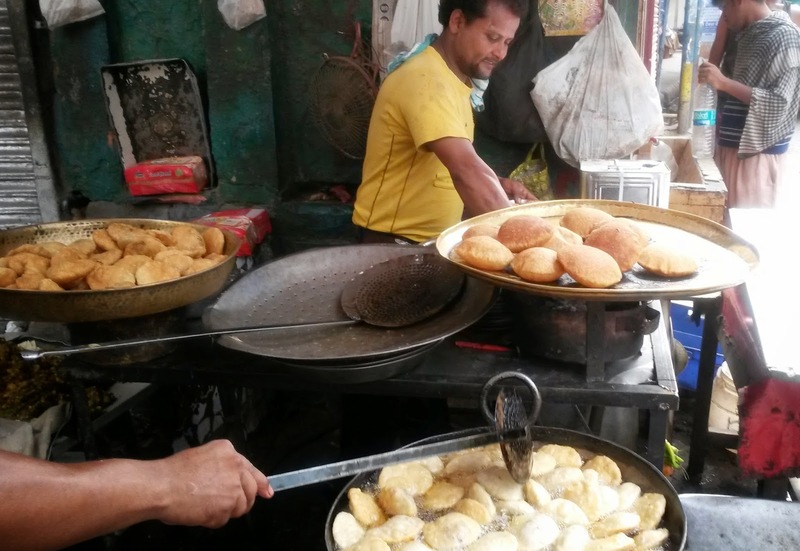 The Bedmi Puri was crisp and golden brown and was served with two different types of alu bhajis and pickled carrots. The alu subzis were dynamically different in taste, one was a bit sweet while the other was spicy. They complemented each other quite well. The pickled carrots too chimed in beautifully providing the occasional tangy taste to the meal. The other thing we tried here was the Nagodi Halwa. Served with ghee puris and the same spicy alu ki subzi, the halwa was a brand new thing for me, but the way you eat it is even more fascinating. After you manage to drill a hole inside the puri, you fill it with the sweet halwa and top it with some spicy aloo before taking a bite which causes a riot of flavor in the mouth. You can, on occasion, also add a bit of the pickled carrot creating a sweet-spicy-tangy combination. 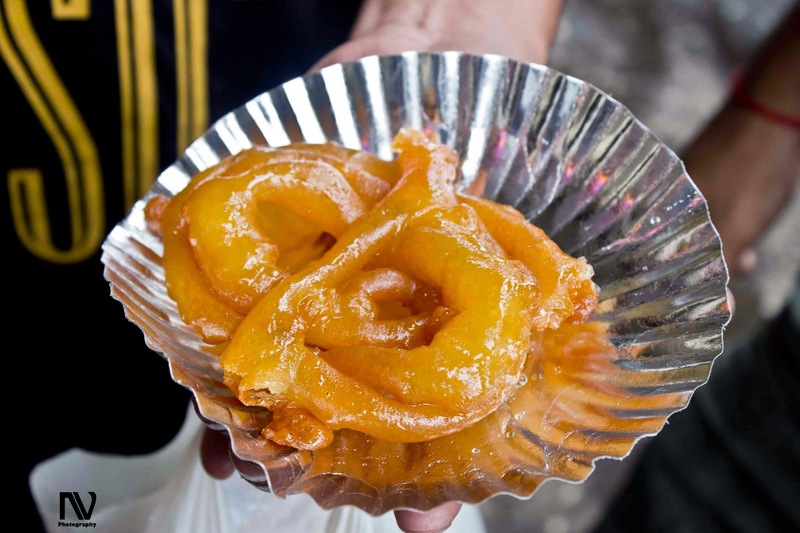 One of the oldest shops in Chandni Chowk, the Old Famous Jalebi Wala was established in 1884 by Nemchand Jain and has since then been treating us to wonderful crunchy jalebis. Their jalebis are thick and juicy and as I sunk my teeth in this crispy outside and gooey inside dessert, the taste overwhelmed me. The syrup is very sticky as it should be and is optimally sweet giving a sense of fulfillment after one has enjoyed ravishing the jalebi. It is truly 'Finger Licking Good'. Though we visited a few of these shops, Chandni Chowk is but a huge foodie maze with small shops selling food in every corner. 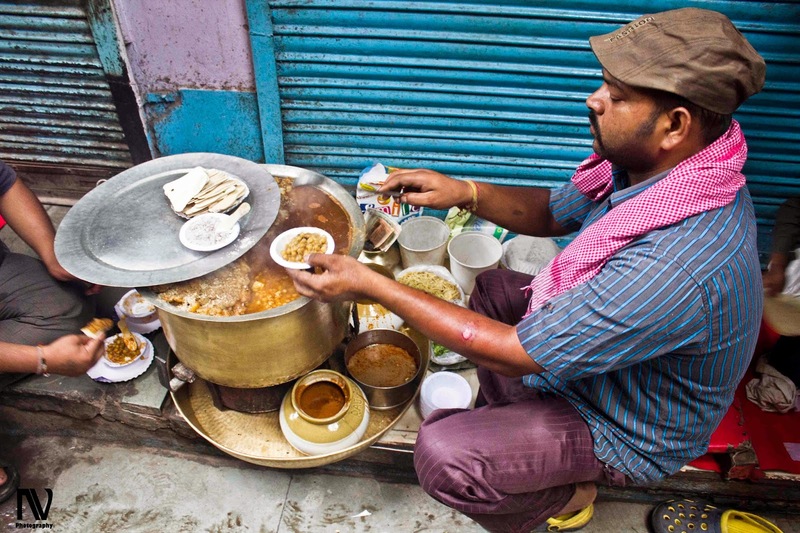 It is essentially the street food capital of India. Ahh this is such a nostalgic post you have written here. Now I cant stop thinking about those Puris and Jalebis and kachoris.. Chandni chauk is indeed a paradise for foodies.